It is our mission to build the health and well-being of the communities we serve through physical therapy and related fitness, injury prevention and wellness services. We will use evidence based clinical practices in a cost effective manner to deliver quality care efficiently. 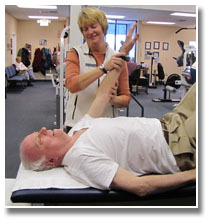 Learn more About Us, Our Standards, and Why Choose Upper Perk Physical Therapy.